S. Paul: I am all for free speech and freedom of the press. When those freedoms are utilized to effectively begin to change people's minds toward a common good, it not only should be praised, it should be raised to the level of heroism. In the case of the Murdoch Empire however, there is no praise to be had and the only heroism exist within the minds of its manipulators. This man's empire, though serving as a wonderful example of the result of aggressive capitalism, represents what can happen when the press is used as a tool to manipulate rather than liberate the people. When a media empire uses freedom of speech as a tool to facilitate bigotry and hatred for the purposes of political and economic gain, it serves only to advance the erosion of our freedom and the division of We the People. Murdoch has made a travesty of what journalism is supposed to be about. And he has institutionalized this on a global level. He has taken what was the distinguished paper of record of the English-speaking world, The Times of London, and degraded it--making it not a watchdog of power, what the press should be, but an instrument to aid those in power whom he favors. He took what had been New York City's paper-of-the-people, the oldest continuously published daily in the U.S., the New York Post, and with his obsession for titillation and sensation, made it a disgrace. With his Fox News Channel, exactly the opposite of the "fair and balanced" outlet it claims to be, he and Republican political operative Roger Ailes have developed what is no more than an unbridled propaganda organ for the GOP. This now includes 150 newspapers in Australia including The Australian, the nation's biggest paper . In Britain, The Times, The Sunday Times and The Sun (and until the scandal forced him to close it, he owned The News of the World with its 2.7 million circulation). In the U.S., he owns the New York Post and The Wall Street Journal and the rest of Dow Jones & Company holdings. He has been seeking to use The Wall Street Journal to take on what has been the U.S. paper of record, The New York Times, and become the new premier American newspaper. He owns the giant book-publishing company, HarperCollins. He owns the 20th Century Fox movie studio. He owns 20th Century Fox Television and the Fox Broadcasting Company. He has been trying in Britain to turn what started as his satellite TV network, Sky Television, into a merged company, BSkyB, a scheme now threatened by the scandal. His cable TV assets in the U.S. include Fox News Channel, Fox Movie Channel and Fox Business Network. 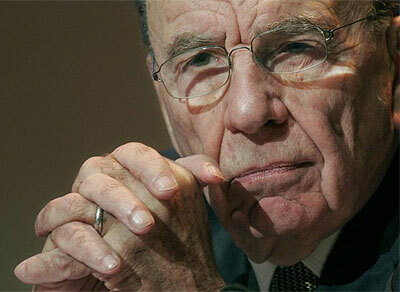 Murdoch's media holdings also extend to Asia, western Europe, Africa, the Middle East, and Latin America. No matter the country in which he has operated, Murdoch has been deeply involved in aggressively manipulating government officials. As Moyers notes, "Politicians become little clay pigeons to be picked off with flattering headlines, generous air time, a book contract of the old-fashioned black jack that never misses: campaign cash"The ambitious can't resist his blandishments, nor his power to get or keep them in office where they can return his favors." Investigative reporter Carl Bernstein writes in this week's Newsweek of how under Murdoch "gossip, sensationalism, and manufactured controversy"substitutes" for the "best traditions and values of real reporting and responsible journalism"this journalistic ideal." Meanwhile, "It's hard to think of any other individual who has had a greater impact on American political and media culture in the past half century. But now the empire is shaking, and there's no telling when it will stop." Karl Grossman has been a professor of journalism at the State University of New York/College at Old Westbury for 32 years. He is a specialist in investigative reporting. He is the author of Cover Up: What You Are Not Supposed to Know About Nuclear Power. He is the host of the nationally aired TV program, Enviro Close-Up.